I grew up in Philadelphia within a creatively-gifted family. My mother was a professional dressmaker and my father was a chef who worked in only the finest establishments. Both were trained in Europe. My sister paints all of the school play sets for her kids. Needless to say, we are an artsy family. My artistic career started in fine art, I loved working with watercolor. However, I decided against a career in art and kept it as a wonderful avocation. After several moves we landed here in the Adirondack Mountain area of New York, near Lake George. It’s a resort area and a great place to raise a family. However, once the children started to arrive, there wasn’t much time to dabble with my watercolors. 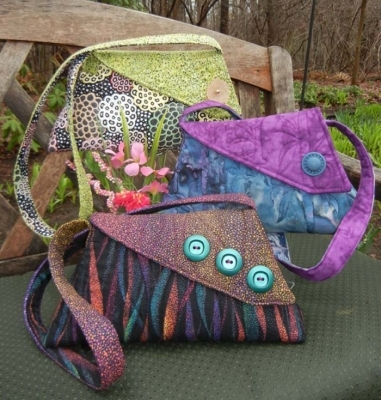 My purses are sold at local craft shows and are available for sale at our regional arts council and other art and artisan-related shops in the area. 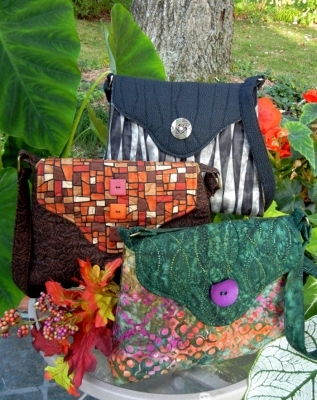 I also enjoy making custom purses based on my current designs depending on the needs of the client. My clients enjoy coming to my studio and “playing” with my fabrics or choose fabrics and designs on-line through my website, www.jeannesbags.com. My quilting friends have encouraged me to make patterns of my designs and finally I have taken on the challenge. You can urchase my patterns at QuiltWoman.com. Some completed bags are available in my ETSY shop along with quilted trivets and coasters. 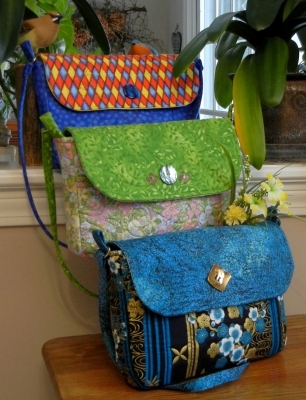 I hope you enjoy my purse designs and have lots of fun making them! Emma is a very versatile shoulder bag. Its traditional design fits any occasion. The narrow strap lends a youthful appearance. There is plenty of room inside, owing to the side and bottom gusset. Pockets are all around inside, including a pen pocket. The flap closes with a magnetic snap and provides security for your things. 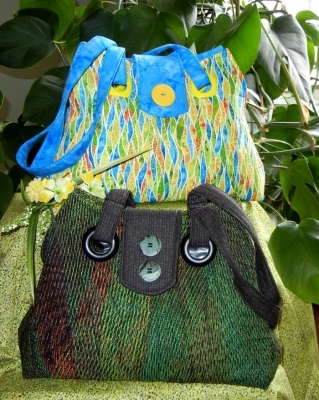 Options for this pattern include length of strap and depth of purse. Perfect for everyday or evening wear. The Diana Shoulder Purse is a small to medium sized purse that is simple to make yet is sophisticated in its design. The diagonal flap with embellishments, such as buttons, and the two fabrics used in the strap takes a simple pattern and makes it special. Pockets inside makes it functional as well as pretty. Julia is a satchel purse that can be worn cross-body or on the shoulder because of its adjustable strap. 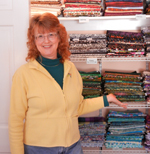 The pattern offers a fixed length strap option as well. 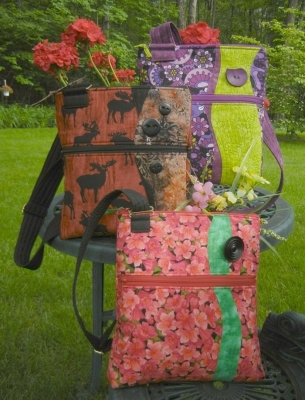 This purse offers lots of security in its zippered exterior pocket and zippered closure. Inside, pockets and a key fob helps to keep you organized. Lots of room, security and hands-free use makes Julia very versatile. Karin is your all-purpose, go-to purse that fits all needs. It is large enough to carry all of your things. This purse is organized inside with plenty of pockets (including a pen pocket) with exterior slip pockets on the back. This purse is a comfortable shoulder length. The flap closes with a magnetic snap and provides security while the scalloped edge adds a feminine touch. A great purse pattern that goes from a work day to an evening out. Veronica purse pattern is designed to hold all of your things in good order while still being fun. It is quilted to add to the purse design, large grommets and decorative button also adds interest. A tab with magnetic snap closes the purse. Plenty of pockets, both inside and outside, organizes your things. There even is a pen pocket. Note the interesting corners, another design feature. Perfect any time of year. A purse not seen around town. Enjoy the uniqueness! This entry was posted in clothing patterns, Crafts, Designers, Fabric, Fun!, Gift idea, patterns. Bookmark the permalink. Your blog was much useful for us. i’ll say thanks you a lot for posting this interesting information.